Compact and highly efficient, this Rotary Semi Automatic Bottle Washing Machine has geneva cam mechanism. The machine is comprised of two nos. SS tanks and pumps, that ensures speedy washing of bottles. Further, a separate panel control is installed in the machine so as to shun any short circuit owing to spraying of water. Easy loading and unloading, simple operations and effortless maintenance, makes this machine highly demanded in the market. 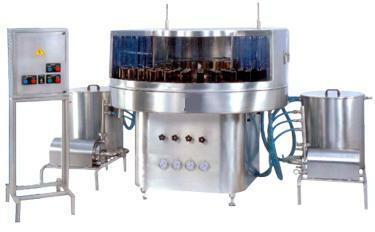 Suitable for washing various types of bottles ranging from: 15 ml. to 500ml. Sequence of washes to customer’ s choice . Out put : 64 to 100 bottles per minute. The stationary nozzles avoid chipping of bottle necks . Pumps and tanks are mounted on portable stand for easy maintenance . Bottle guide system specially for light weight bottle. Separate panel control to avid any short circuit due to spraying of water.